Next review Empire Today - Fed up! Thank you for bringing your concerns to our attention. We are disappointed to hear that you were not satisfied with your installation experience. We will be in contact with you soon to review your concerns and start working towards a solution. The salesperson promised a complete, professional and clean demo and installation. I received non of the above. He told me they would curtain off all non working areas and that was far from true. When they were removing the old tile it was like a war zone here. We were in another room and pieces of tile was hitting the door like golf ball size ice pellets hitting a tin roof. Tile flew everywhere. They never sealed off the other rooms , so the became full off broken tile, soot and dust. If it was not for me putting a large rolled up bath tile under the bedroom door we might have been hit by chard pieces tile. The whole myth of the operation is Empire does not employ their own installers. They sub out all the work to below standard companies, who really don't care about the quality of work or the customer , they just want to get the job done and get paid. I complained all that horrible day and was greeted the next morning by a crew of about 6 or 7 men to start the install. After not getting a satisfactory explanation the first day , I was not going to be happy with these people to complete the job. I made a few phone calls to Empire and then decided to ask them to leave the premise. They also stated that the just might have enough tile to lay it in diagonal pattern like I had paid for..Bottom line is that they charged me a astronomical price for the fist dsy of demo $$$900.00. I am seeking another companyto finish the work.. CONSUMERS BEWARE !!! THE BIGGEST. RIPOFF COMPANY GOING !!! 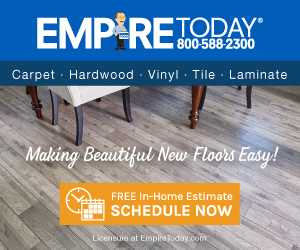 Product or Service Mentioned: Empire Today Tile Installation. Review #1006629 is a subjective opinion of User1006629.